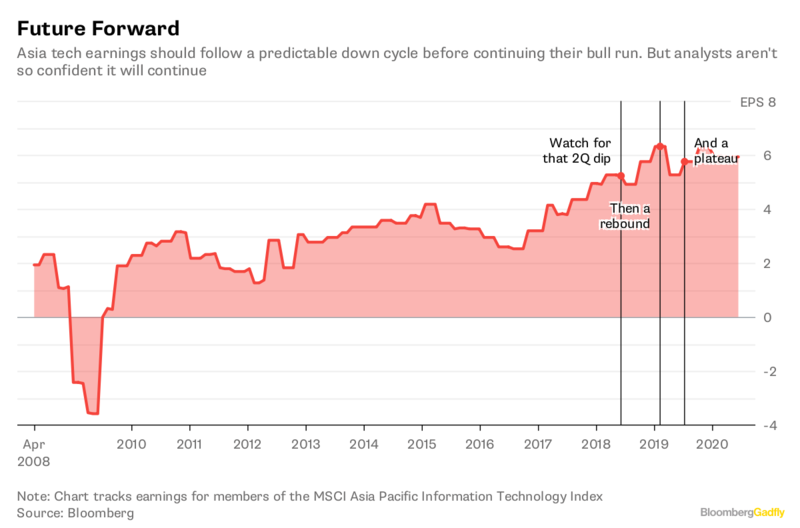 Asian technology earnings are in a bit of a funk right now, and that’s reflected in the very lackadaisical performance of the MSCI Asia Pacific Information Technology Index. Investors who shorted Tencent Holdings Ltd. a month ago would have done well, as I predicted even when the company’s most-recent set of earnings beat estimates. Largan Precision Co., a supplier of camera modules to Apple Inc., last week reported net income that missed expectations by 27 percent, the most in at least a decade. Sell-side analysts seem to be factoring these troubles into their models, with EPS estimates dipping for the coming period. The second quarter is usually the worst for tech industry earnings, mostly due to the year-end festive seasons that drive purchases and exaggerate the decline in subsequent spells. This has eased off a little as Lunar New Year plays a larger role in lifting the first quarter, while shopping festivals in China and India help balance out the third. Still, there’s not much to look forward to in the boring months from April to June. This year will be no different. Beyond that, though, it appears many analysts aren’t convinced earnings growth can continue for much longer. EPS for the benchmark looks set to peak early next year. Tencent, Samsung Electronics Co., Alibaba Group Holding Ltd. and Taiwan Semiconductor Manufacturing Co. are the index’s largest members, accounting for 45 percent of its weight. Each has its own macro and company-specific challenges. Some of those — management issues at Samsung, an unclear electronics outlook for TSMC — may get clarified in the coming months. If that happens, the outlook for earnings may get rosier. For now, though, analysts aren’t betting on it.